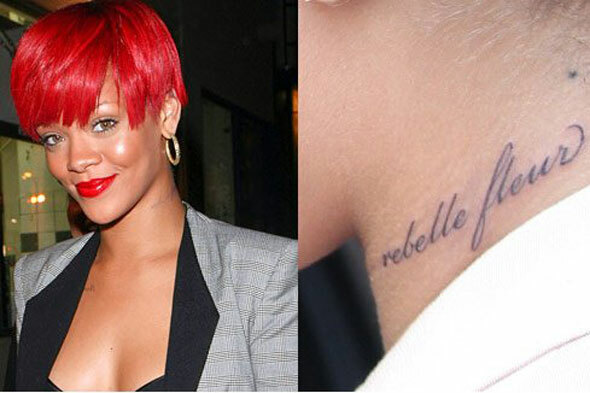 Rihanna has definitely come into her own between her debut album "Music of the Sun" and her latest and most provocative, "Rated R." She wasnt the first celeb to go buck and get a plethora of tattoos but she set the stage for all those who thought you couldnt be high fashion and still have tattoos; hense her Gucci endorsement. Her most recent stunt is a tattoo on her neck? I found these pictures on google while looking for tattoos of interest. Idk if these are real but there is more than one picture of her with this tattoo....ummm if it is real....idk if I'm feeling it. She may be taking it a little too far now. I have nothing against women with neck tats but it comes a little "gangster" at times and may clash with certain attire, let alone the tattoo on the back of her neck.